Is Your iPhone, iPod Touch Or iPad Compatible With All iOS 7 Features? 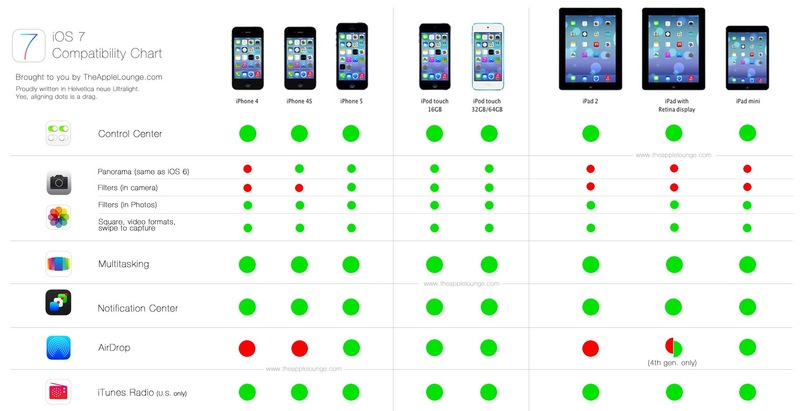 We previously shared with you which iOS devices would be compatible with iOS 7, but now a better compatibility chart has been released by TheAppleLounge. The website has created a detailed chart that shows all of the main new functionality within iOS 7 and which iOS devices will be compatible with which feature. As it stands right now the only two devices that will be compatible with every single feature of iOS 7 is the iPhone 5 and 5th generation iPod Touch. Although the only device to get left out out in the dark by iOS 7 was the iPhone 4GS, other devices will not have all of iOS 7’s functionality. For the full resolution image click here. Starting with iPhone’s, the iPhone 4S and iPhone 4 loses the ability to apply lossless filters to photos from the Camera and will not include AirDrop functionality. It is worth noting the iPhone 4 will not have the Panorama mode in the Camera app either, but this was the case with iOS 6 as well. As for iPad’s the 2nd generation iPad will not get AirDrop functionality, only 4th generation iPads with Retina display and above and the iPad Mini is compatible with AirDrop. When it comes to being able to take Panorama photos or apply lossless filters to photos directly from the camera no iPad model is compatible. Are you disappointed by the compatibility with some of iOS 7’s features? Let us know in the comments section below. will ios 7 be compatible with ipod touch 4g? ipad 3 will not compatible with IOS7?